Theses animals have known only the worst of humanity. They cower together in a corner of the barn but will come running when it’s feeding time. It’s undoubtedly the most food they’ve ever seen. It’s going to take time for them to understand that they’ve found sanctuary. It’s probably a little scary to see a team of white-clad humans surround you as they begin poking and prodding. It’s been a hectic time since 27 goats arrived from a horrific backyard slaughter operation. They were immediately treated for worms and lice. And as if having lice isn’t bad enough, they have two different kinds. So we’ll treat them a second time this weekend and it’s possible they’ll need a third treatment as well. Luckily, we recently finished renovating an old barn so it’s been easy to quarantine them. They’ll remain there for several more weeks, maybe longer if they have orf, a painful infection of scabby lesions around their mouths. Think herpes on steroids. The caregivers are following protocol and only enter the barn while wearing disposable Hazmat suits. Their boots are chemically disinfected so they don’t spread contamination to the healthy residents. But they speak gently as they hold each goat and promise a better life to come. Everyone was examined by the caregivers. 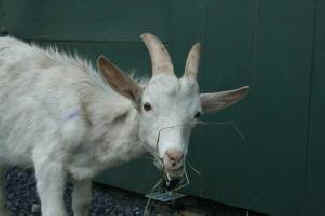 One-by-one goats were examined, administered antibiotics, and had their hooves trimmed. Then the ordeal was over and they were released into a four-acre grassy field as “Next!” was called. A couple of the goats may have thrush, a fungal infection on their hooves so we administered a topical antibiotic. We’re also watching two other goats who may have a neurological problem. They’re walking on their knuckles instead of their hooves. And because it seems these poor creatures seem to have every infliction imaginable, a few of them have crackling in their lungs indicating pneumonia. The females appear to be very young, but we suspect a few of them are pregnant. It’s difficult to confirm since they’re so emaciated. Unfortunately, they’re also anemic so we’re prepared for the possibility of stillbirths. To prevent any further pregnancies, we are scheduling the vet to neuter all of the nine males. They will spend recovery time comfortable in a barn stall we’re setting up just for them. The immediate problems have been addressed. But they face a long road to full health. Expensive antibiotics, vet visits, food, and disinfectant are just some of the costs we’re incurring. 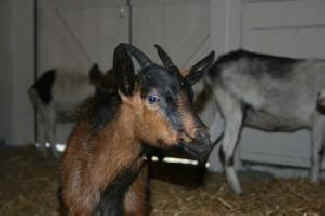 But it’s been worth every penny and every minute to give these goats their first real chance at life. Will you please help by making a donation of $27? That’s one dollar in honor of each life saved. From the bottom of our hearts, THANK YOU.